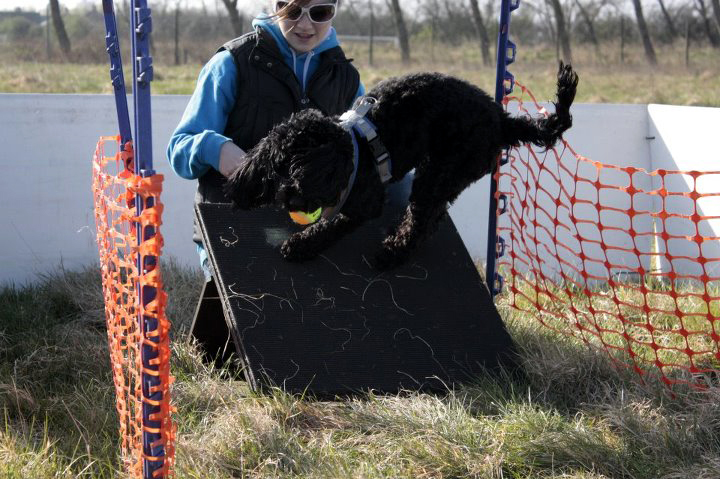 Flyball has been described as “drag racing for dogs” and also “the extreme sport of the canine world requiring skill, athleticism, balance and plain old guts on the part of both the dog and handler”. Cockapoos fit the profile perfectly. The sport has been developing for over 25 years and has leapt forward in terms of the development of the equipment and rules. At first the rules were on one piece of paper and now they are over 60 pages long. So this article will just be a taster to give you an insight to the sport. A basic description is “A relay race for four dogs where each dog covers a total of 102 feet on a course and has to negotiate eight hurdles. After jumping the first four hurdles, the dog must trigger, release and catch a ball from a spring-loaded box. The dog must then carry the ball back over the four original hurdles. After the first dog completes the course the other dogs take their turn”. Top dogs have been clocked at speeds of 20 miles per hour, and are so fast that an electronic sensor system is used to start the dogs and judge their passes. Some dogs can complete the course in just 3.7 seconds, with the entire team completing the course in little over 15 seconds. 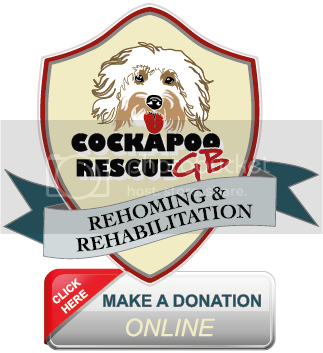 When I first saw a flyball race I though it must take years of training to get a Cockapoo to do this sport. But we were given the chance to have a go and my dog got the basics of going down the course and bringing a ball back to me. So our involvement started with us enrolling on a 6-week beginner’s course. Starting with the basics the course is in netting to channel the dog to the box and guide them back to you. You start by practicing recalls from the box, the box loader holds on to your dog and you call your dog down the jumps to you. Lots of praise is given, although in most cases your dog runs off into the field to have a good run and you stand embarrassed calling your dog. You’ve learnt your first lesson, you need some better treats! Then you progress to sending your dog down the jumps to retrieve the ball held at this point by the box loader who calls your dog in a very professional and encouraging voice. In my case, however, my dog went down the jumps but instead of getting the ball jumped the netting and went for another run - back to being embarrassed! This is normal and all the dogs do this at first, and slowly but surely the improvement comes and your dog is running the course and bringing the ball back. Next the ball is loaded into the box and as the dog gets to the box the box loader triggers the box and the ball flies out. Some dogs at this point take flight and run back up the jumps minus the ball, but eventually they get the hang of triggering the box with their feet. 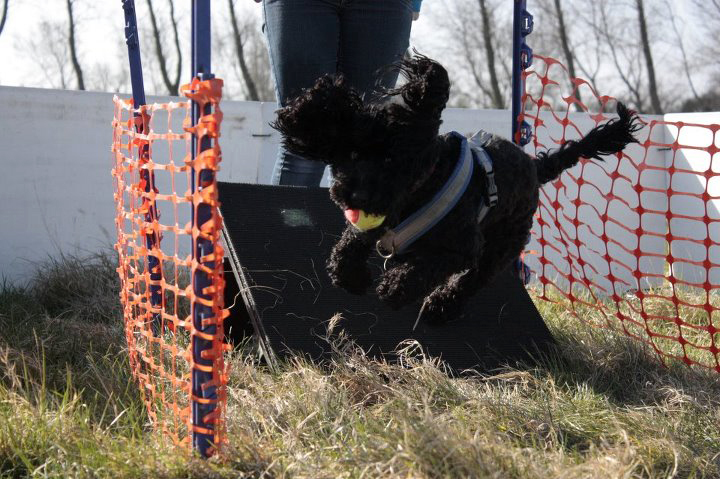 Then over a couple of weeks the netting is removed and your dog is running the course (most of the time) and you and your dog realise that this is fun! And you do start having fun. With the daft antics of the dogs you find everyone is having a good laugh, not at you but with you - it’s such a friendly sport. Now you are ready for the next stage, running with two lanes side by side. This is somewhat a challenge for the dogs at first. Without the netting they can and do run into the other lane, but again they do get the hang of it and you start getting good fun races. You can if you want stay at this level without competing and just do it for fun. Most clubs have classes at different levels and don’t push you into competing, but I challenge you not to get the competitive bug. If you move up a level you then start to perfect working as a team with tight crossovers and well timed starts, but this is the hard stuff. Flyball dogs must be at least 1 year old but can start to train at 10 months (but not on a box). Dogs should have a good basic recall. Dogs should get on with other dogs and show no aggression. Dogs of all sizes can compete, since each team's hurdle heights are dependent on the smallest dog. Dogs' heights are checked until they are 30 months old and receive a height card. Dogs must be over 18 months old to compete in division races. 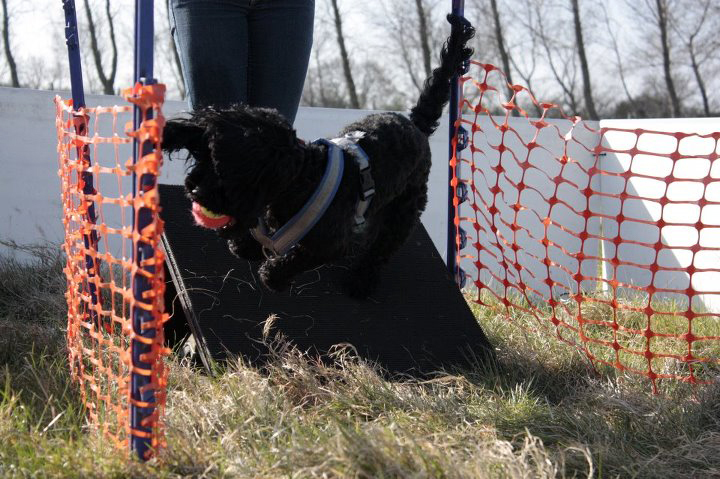 From 1 year old dogs can compete in starters competitions and run in netted lanes. 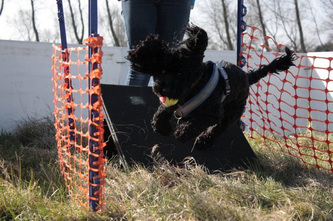 Flyball is open to all breeds and sizes of dog. Points are awarded to each dog in a leg of a race if the team completes the leg in less than 30 seconds. The first team to win 3 legs wins the race. Teams compete in divisions with teams with similar declared times. Most BFA. competitions run starters comps and they are usually the first races of the day, so an early start usually at 8:30am. It is run in groups of six teams, and as normal split into two sessions, so the starters is also the first event of the afternoon. The races are run in two lanes side by side in netting to help guide the dogs through the course and if your dog has progressed to running without netting it can be quite off putting for them at first. Also in the ring there is the ring party. This is the head judge, timers, start and box judges, and is something dogs have to get used to in competitions but it is very strange for them at first. Each team can have as many as six dogs but only four can run in each leg so frequent changes are made so every dog can have a run. The referee starts the leg and the quickest team to complete the course wins the leg. The first team to win three legs wins the race. The team with the most wins comes first. Sounds simple, doesn’t it? But not in starters. If it’s not false starts and bad crossovers, it’s dogs not bringing the ball with them or dropping the ball (known as spitting the ball) so they have to run again. Total confusion can reign and sometimes it’s only the judge that seems to know what is going on (it’s so much easier to see what’s going on in division races). In this confusion the noise can become deafening; dogs barking, handlers calling their dogs and running around trying to catch their dogs to send them again. It looks amusing but you never laugh because you know you’re in the ring next. Remember, this is where you and your dog learn the sport, and as you leave the ring a complete stranger will come up to you and tell you how well your dog has done and give you a tip or two. Another thing you will see is a very experienced handler from another team in the ring coaching an inexperienced handler. This is the type of sport it is; you make a lot of friends and the only time you are a rival is in the ring. The teams are called to the ring two at a time with the next two on standby. The team has two minutes of warm up. The dogs do a recall from the box over the jumps and then do practice runs. The judge ends the warm up and lines the teams up. They get signals from the judges. Count down: three, two, one - go! The leg starts. First team to complete the course wins. A dog must re-run if it doesn’t complete the course or enters the course before the dog running finishes. If your dog interferes with the other team running, the other team is awarded the leg and you do not record a time. fastest time the team has run). The course and race format is the same as starters but with no netting. Electronic starting and timing equipment is also used. through the start gate as the third light in the start sequence illuminates. Too early and a red light comes on and the leg has to start again. If your team gets three red lights you lose the leg. As the third light illuminates the electronic timer display starts. The next dog’s handler has to time the release so the dogs cross as close as possible after the dog returns through the start gate. As the dogs return through the start gate the digital timer above each lane shows the time so far in the leg and is recorded by the timer and a representative from the team. The team rep also signals the gaps between the dogs to the handlers so they can adjust their releases. A light is illuminated when a dog does a mistake. The start judge illuminates this. The box judge watches for the dog putting at least one paw on the box and that the box is triggered. Top dogs use all four paws on the box and do a turn similar to a swimmer. The box judge signals a fault by raising an arm. The start judge watches for any other fault and illuminates the light. If you get a light your dog has to run again. If more than one dog gets a light they have to run in the same order as they had run the leg, but in most cases if a team gets more than one light they concede the leg and record a ‘no time’. 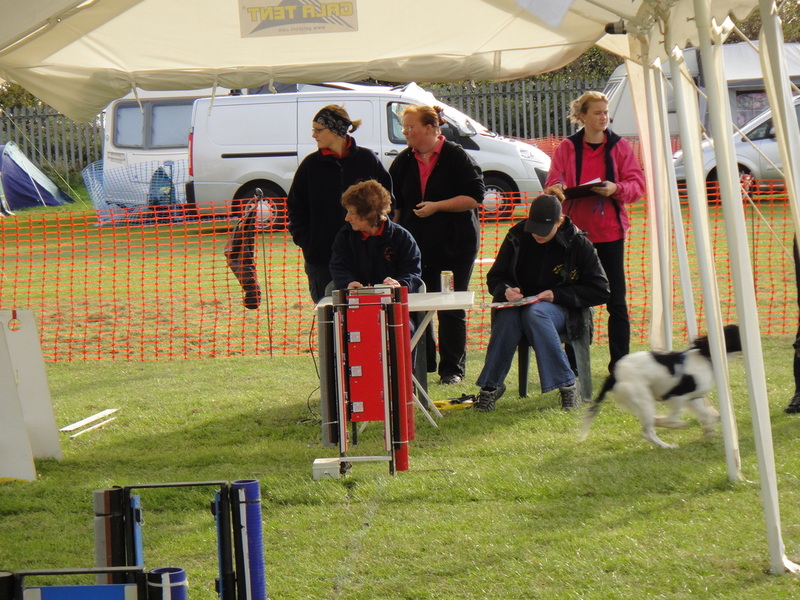 As the last dog completes the course correctly the start judge presses a hold button and the time for that leg is recorded. Again the team to win three legs wins the race. The unique thing about this sport is that you can lose every race on a day but your dog can accumulate points towards an individual points award. Points are awarded to each dog that ran in a leg if the team time is below 30 seconds, starting with 5 points and increasing the quicker the time recorded. ring. The new dog get its chance if the team is two legs up as the team could lose a leg, but still win the race by going back to the original four dogs. Most teams have teams of six dogs and do change dogs around during a race. The worst thing a dog can do at this level is to interfere with the other team as this automatically loses you the leg. A team also needs members in the ring that are not racing. A team consists of up to six dogs and handlers, a box loader (that all the dogs respond to, as the only encouragement they can give the dog is verbal), a rep for start and cross over timing, a scribe to record individual times for each dog for club stats, and last but not least someone to collect the loose balls in the ring (some dogs will go for the easy option if there is a ball in front of them as they start their run). Again a small team will get help from other teams for this. Also your team must supply three members for ring party duties during a competition. Competing involves early starts and long days, but it is all worth it to see so many happy dogs and handlers in one place. It’s a superb opportunity to socialise a puppy or young dog. At one competition we competed in there were just under 100 teams competing over three days. It was an amazing experience. The thing to remember is that dogs never make mistakes - they are just being a dog. It’s the handler that makes the mistake, and don’t I know it!